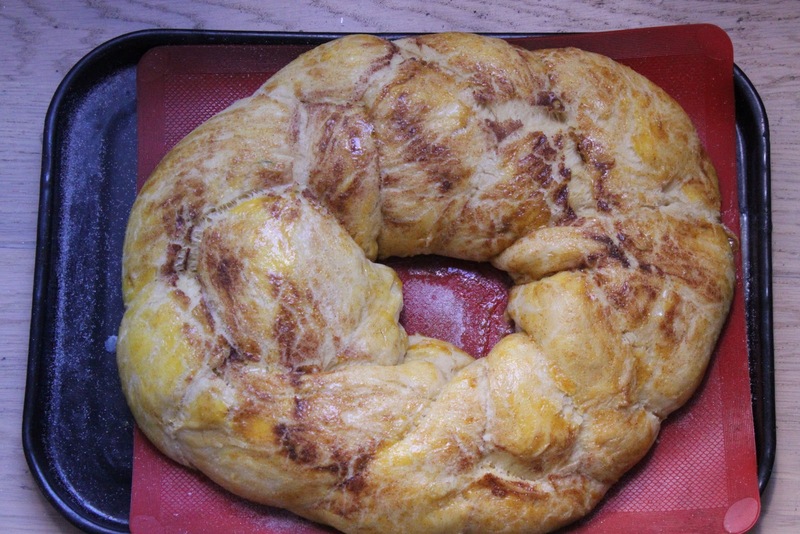 Panettone and galette des rois are versions of the Epiphany King Cake, commemorating the arrival of the Magi. 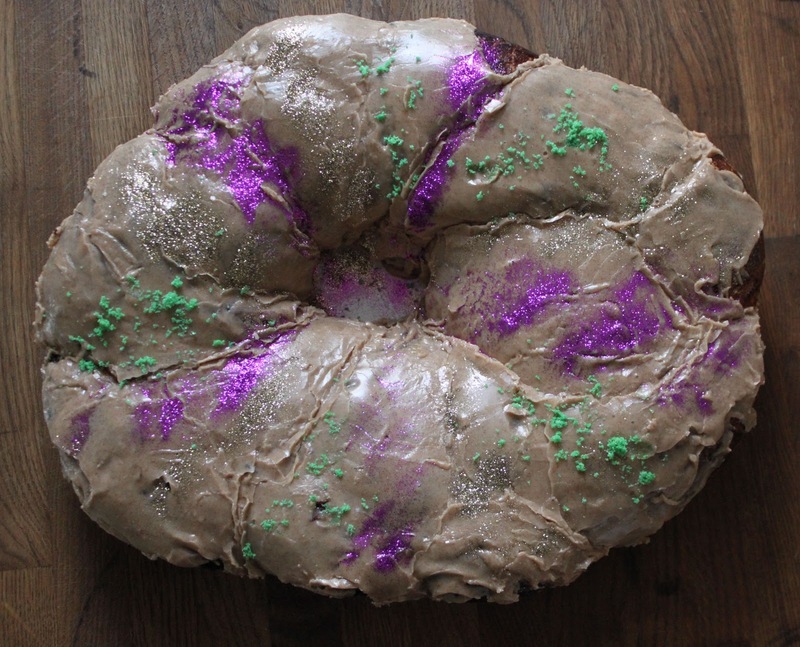 Here’s another King Cake, fairly unknown in Britain, but a Mardi Gras classic in New Orleans, where every bakery sells them, blindingly decorated with the traditional carnival colours of purple, green and gold. Although it is a Fat Tuesday dessert, bakeries start selling King Cake from January 6th onwards. 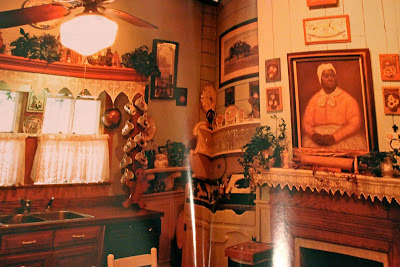 I found this King Cake recipe in a charity shop cook book ‘Hot Beignets and warm boudoirs’ by Chef John D. Folse CEG AAC, who sounds more like a confederate general than a cook. The book explores the breakfast and brunch tradition in the South, with beautiful but ’80s style photographs of four poster beds trimmed with lace in large elegant clapperboard colonial mansions and portraits of ‘mammy’ above the fireplace in the kitchen. 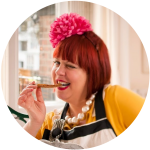 The recipe itself produces a cake similar in flavour and texture to panettone, without the dried fruit, but crucially, in sweet toothed America, with a truck load of sweet cinnamon icing on top. I didn’t have the coloured sugars so substituted edible glitter instead which I felt worked, being equally gaudy. A reader recommended this beautifully written book on New Orleans’ cuisine “a flood cannot destroy the most interesting and ingrained food culture in my country”: Gumbo Tales by Sara Roahen. I really am sorry, but I can eat snails, offal, naga chillis, but anything purple (including beetroot) has my throat going "no no". Sad, but true. Even purple sprouting has that effect; it's impossible to divorce food from colour and purple has that subconscious poison association that's hard to shift in my (ok, shuttered) mind. I love the colors of Mardi Gras on the galette des rois. Very festive!